Is it in the Wolgan? I think there was a photo of it in Pete Taylor's Wolgan Guide. Can't remember the name though. (Hint: I thought the route would be too easy to guess; think iconic like Kachoong; which is why I chose the night picture and asked for the pitch involved. ... And since we are on a new thread page, here it is again to save going back a page to see it. No, though you are in the right State. ... I am starting to learn how far Trip Reports don't go. Looks like the North wall of the Gorge at Buffalo. I'm thinking probably Ozy direct, no idea which pitch. Something above big grassy. Maybe the Fang pitch? >Something above big grassy. Maybe the Fang pitch? Blerrie close, but only a cigarette instead of a cigar...?? Hmm. Upon thinking about it further, there could be a twist to the answer, and we may end up having to get phillipivan (who I think is the climber in the photo), to have to adjudicate. Hard to tell on a dark and rainy night (insert whatever sounds that turn you on for such events here), but I think the photo on the right is where he is at. >in the photo), to have to adjudicate. I was thinking something similar... specifically in that he most likely isn't on a pitch at all! >I was thinking something similar... specifically in that he most likely isn't on a pitch at all! Ok, it is probably Scott in the photo, and I will let the readers work out the rest of your cryptic post. After re-reading trip reports for the 2014 Aidfest they confirm that Scott is the climber in the photo. I thought you were referring to pi not being on the pitch due 'spacewalking' a rope suspended in the void while cleaning the previous pitch. I misconstrued the meaning of penultimate. 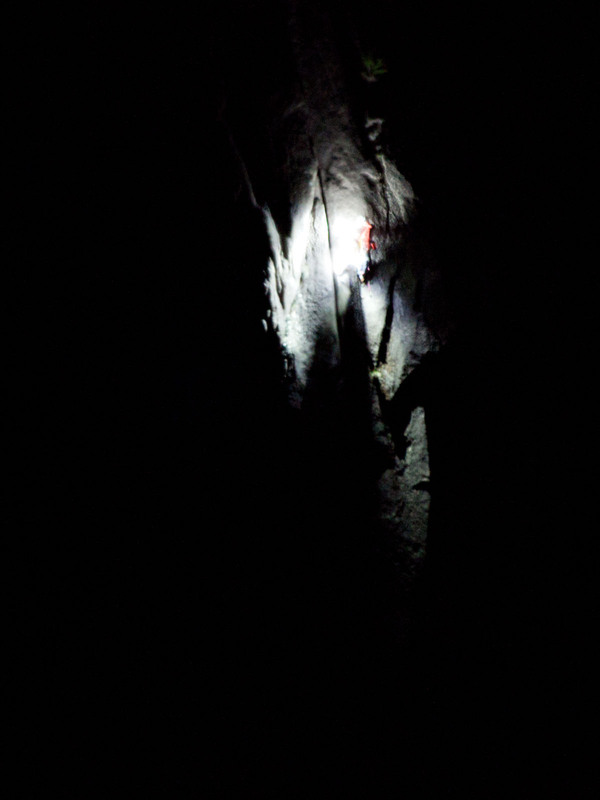 The most recent guidebook describes it as having 3 pitches after Gledhill Bivvy - 30m up to a HBB (where I think Scott is in that photo), 50m to the ledge (what I was describing as the penultimate pitch), and then 15m to the top.